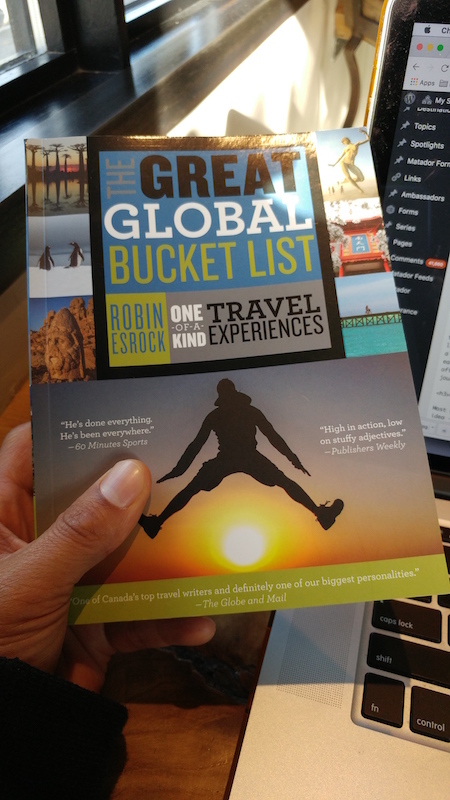 I HOLD in my hand a copy of The Great Global Bucket List, sent to me by its author — and friend — Robin Esrock. He doesn’t try to pass himself off as a “gung-ho adrenaline-junkie,” but as someone who was simply “blessed with an unusual amount of curiosity.” He makes it clear that this book is for everyone, that most things in it are things that most people can actually do. Below you’ll find 10 global spots from Robin’s profile on the travelstoke app. But first, though, Robin answered a few burning questions I had for him about his travel experiences. MN: What was the weirdest thing you experienced in your world travels? Robin: There’s been so much weirdness I had to create a separate category for it in the book. A toilet themed restaurant in Taiwan, running with the Hash House Harriers in Bucharest, ripping around Berlin in a luminous pink East German Trabant, a bone church in the Czech Republic, drinking with Mongolian chieftains, crashing a celebrity wedding as the entertainment in Copenhagen, negotiating with armed kids in tribal Ethiopia, getting set on fire, eating guinea pig and fermented shark and bugs and raw baby beluga. I embrace the weirdness, which is why I started off with a blog called Modern Gonzo. When things are weird, it often becomes the most memorable highlight of any journey. That being said, weirdness is in the eye of the beholder. Will traveling around the world really make someone a better human being? Why? Most certainly. We all have an idea of the world, its people, and how things fit together. But that’s all it is, an idea — created by the media we’re exposed to. On the ground, you realize that everything has so many nuances, and can be vastly different to your expectations. Meaningful travel is an antidote to the 24/7 fear-mongering news cycle. It rips down the Wall of the “Other” we’re biologically wired to fear. Walls built with ignorance and promoted by those who profit off them. One of the most memorable nights during my journey was drinking tea with fellow travelers from Lebanon and Saudi Arabia in the shadow of the Blue Mosque in Istanbul. Jews and Muslims breaking bread, discussing painful issues with respect. Listening to each other, with an open heart and an open mind. More than beaches and nightclubs and tourist attractions, that’s the gift of travel. It’s a treasure box of positive experience, but the key is having the right attitude. What was the most heart-warming thing you saw or experienced in your research for this book? I visited over 100 countries and have never been robbed, attacked or [become] seriously ill. The kindness of strangers and the overall decency of people has always surprised me. I lost my travel hat in a Bangkok taxi cab flying to Tokyo, and it found me again (as did a money belt with my passport in Bolivia). I asked 1700 people from 72 countries the same three questions about their lives, and the universality of their answers is a source of endless inspiration for me. I spoke about this at Wanderlust, and will be writing more about it in my next project. What would you say is the most important thing you’ve learned in all of your travels? Wherever you are, is where you’re supposed to be. We’re a culture that second guesses our decisions to a point of neurosis, especially when we’re traveling. With limited time in a new place, you have to make decisions about where to go, what to see, eat, and explore. Once you make that decision, believe in it, let it carry you forward. Regretting that you should have ordered the salad or gone to a different temple leaves you in limbo, unable to appreciate the moment you’re in, and unable to experience that which you missed. Travel taught me how to be present and content with decision-making, at home and on the road. It’s not always easy to do, but it definitely helps. Other key lessons I’ve picked up: Don’t panic; smile; trust your instinct; and it’s the people we meet who create the paradise we find. Give me 5 words that encapsulates what travel means to you. Editor’s note: The below spots are all taken directly from travelstoke®, a new app from Matador that connects you with fellow travelers and locals, and helps you build trip itineraries with spots that integrate seamlessly into Google Maps and Uber. Download the app to add any of the spots below directly to your future trips. Check out the largest used-to-be waterfall on the planet: Dry Falls Heritage Area. Sail to the Antarctica Peninsula with One Ocean Expeditions. Learn about indigenous culture and watch wildlife in Gwaii Haanas National Park. Gwaii Haanas National ParkSandspit, CanadaThey call this part of the world the Galapagos of the North. Incredible wildlife and nature meets fascinating Haida culture, art and history. You can only get into the protected archipelago by boat or kayak. This is me standing next to the ancient totems on Sgang Gwaii, a UNESCO World Heritage Site. #canada #history #britishcolumbia #haida #sailing #bucketlist #forest #totem. Climb Mount Nemrut in eastern Turkey. Kayak Bacuit Bay, El Nido. Visit Nelson Mandela’s house in Soweto. Contemplate Stonehenge in the UK. Explore the Great Barrier Reef without the crowds at Lady Elliot Island Eco Resort. Get your open-water dive certificate in Port Morseby, Papua New Guinea. Hike the Inca Trail to Macchu Pichu.